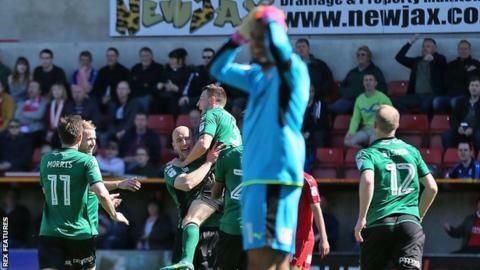 Swindon Town were relegated to League Two after losing at home to Scunthorpe, with Bury's victory condemning the Robins to the drop. The Iron led early on when home keeper Lawrence Vigouroux dropped a cross, which hit Murray Wallace and went in. Swindon's fate was effectively sealed as Sam Mantom swept home a second for the visitors from a low ball in. Rohan Ince netted from range but the Robins, with Tim Sherwood as director of football, could not save themselves. With just one game remaining Swindon are five points behind 20th-placed Gillingham, while Scunthorpe cannot now be automatically promoted after Bolton's win, meaning Graham Alexander's side will contest the play-offs. Swindon Town: Does Tim Sherwood manage the Robins or not? In November, Tim Sherwood was named director of football at the County Ground, a move described as "one of the biggest appointments the club has ever made" by chairman Lee Power. The former Spurs manager was given responsibility for "transfers, the way we play, the formations and the picking of the team" - though head coach Luke Williams was kept in his post. Despite an impressive 3-0 win over Charlton in their first game following Sherwood's arrival, the appointment did not result in a sustained improvement in form, as Swindon have won only seven of their 31 games since his hiring. At times, it was unclear whether or not Sherwood was managing the team, though in recent weeks his first-team responsibilities have decreased, and he has not attended all of the Robins' games. But the return to a more conventional coaching structure has not paid dividends, as a four-game winless run sent them down to the fourth tier for the first time since 2012. Match ends, Swindon Town 1, Scunthorpe United 2. Second Half ends, Swindon Town 1, Scunthorpe United 2. Corner, Swindon Town. Conceded by Neal Bishop. Foul by Rohan Ince (Swindon Town). Stephen Dawson (Scunthorpe United) wins a free kick on the right wing. Attempt missed. Luke Norris (Swindon Town) header from the centre of the box misses to the right following a corner. Attempt saved. Rohan Ince (Swindon Town) right footed shot from outside the box is saved in the bottom left corner. Corner, Swindon Town. Conceded by Joe Anyon. Rohan Ince (Swindon Town) wins a free kick in the attacking half. Rohan Ince (Swindon Town) wins a free kick in the defensive half. Jamie Ness (Scunthorpe United) wins a free kick in the defensive half. Substitution, Scunthorpe United. Craig Davies replaces Paddy Madden. Attempt missed. Rohan Ince (Swindon Town) right footed shot from outside the box is close, but misses to the left. Goal! Swindon Town 1, Scunthorpe United 2. Rohan Ince (Swindon Town) right footed shot from outside the box to the top right corner. Assisted by Raphael Rossi Branco. Delay in match Scott Wiseman (Scunthorpe United) because of an injury. Attempt missed. John Goddard (Swindon Town) right footed shot from outside the box is close, but misses to the left. Corner, Swindon Town. Conceded by David Mirfin. Substitution, Swindon Town. Luke Norris replaces Fankaty Dabo. Goal! Swindon Town 0, Scunthorpe United 2. Sam Mantom (Scunthorpe United) left footed shot from the centre of the box to the bottom left corner. Assisted by Josh Morris. Attempt missed. Stephen Dawson (Scunthorpe United) left footed shot from outside the box is too high. Substitution, Swindon Town. John Goddard replaces Charlie Colkett. Substitution, Scunthorpe United. Sam Mantom replaces Ivan Toney. Ivan Toney (Scunthorpe United) wins a free kick on the left wing. Corner, Scunthorpe United. Conceded by Raphael Rossi Branco. Jamie Ness (Scunthorpe United) wins a free kick on the left wing.